As much as I adore all types of music, once in a while an impossibly groovy band comes along that peels my seamed stockings right off. A new friend told me to check out Minibar, and since the band was opening for an old friend of mine, actor-singer Harry Dean Stanton, I found myself at L.A.'s Mint, drop-jawed and joyous over this thrilling British import. Of course, I had to set up some chat time. Minibar's first album, Road Movies, is out this week and crammed with witty and insightful lyrics, catchy melodies and soaring So Cal-heyday pop harmonies. I met up with the boys at another L.A. club and spent a couple of hours talking about their rocky rockin' road to the California good life. 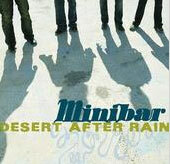 After paying dues in England, Minibar moved to L.A. and got signed to Universal after playing just two gigs. Still, frontman Simon Petty insisted, "the album is borne out of misery. I was living on Sid's sofa [bass player Sid Jordan], the deal hadn't gone through, we didn't know what was going on. So, now it's a dream come true--and we don't have anything to write about!" Petty writes the bulk of the songs. "Then," he said, "I bring them to the band, and they say, 'Well, that's crap!' " Hmmm...I don't think so. After hearing the Wallflowers' Bringing Down the Horse, Minibar decided the album should be produced by T-Bone Burnett. "They weren't big in England, so we hadn't heard the album yet. T-Bone is great!" Petty enthused. Los Angeles radio station KCRW's Morning Becomes Eclectic has been heavily playing Minibar's "Choked Up," a Ryan Adams song--and the only cover on the CD. "Lyrically, it fits in with the whole album," Petty said. "It's a song he rejected. We love it, and thank you for the crumbs under your table, Ryan!" Some tasty crumbs, indeed. If you'd like a sample for yourself, Minibar performs live this Wednesday (April 11) on KCRW (89.9 FM), which can also be found on the Web at KCRW.com.